Church and Land, Church and Community, and Church and Empire/State. 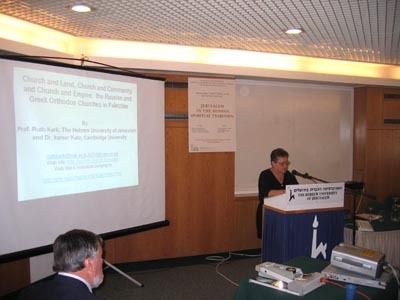 Denecke, Goren and Kark (2005 in press) asserted that an important component of global Christian settlement and expansion was the policy of land acquisition to enable settlement. In Palestine, Churches and missions including the Russians and the Greek-Orthodox Patriarchate were highly active land purchasers from the second half of the nineteenth century onwards. There are ample records of these properties serving as sites for the planning and building of new institutions, businesses, and settlements (churches, monasteries, hospices, schools, hospitals, orphanages, markets, agricultural estates etc.) that illuminate the ideological intent, financial sources and impact of Church real estate activities. Both religious and economic considerations lay behind the land acquisitions. Granott related to real-estate investments in Palestine by the various churches from 1863 onwards. The churches bought and accumulated numerous plots of land, some of which were intended as investments in profitable assets. This land acquisition had an impact on the physical and cultural landscapes of the country, both urban and rural. In both the Greek-Orthodox Patriarchate of Jerusalem and the Russian Orthodox Church in Palestine, most of its clergy was of Greek and Russian origin. Although this is not the only case in the Middle East and Palestine/Israel in which the heads of the Church were, and sometimes remain, of a different ethnic origin and nationality than the local Arab congregation, most of the Christian churches in the Holy Land (such as the Catholic, Anglican and Lutheran) have undergone a process of Arabization in recent years, with local Arab clergy replacing foreign priests. The Orthodox Patriarchate and the Russian Church continue to be closely controlled by ethnic Greeks and Russians. The Greek-Orthodox Patriarchate, the oldest Christian Patriarchate in Jerusalem, is currently representing one of the largest non-governmental pools of real estate of in the State of Israel. The interests of the Church establishment and its largely Arab local congregation were often in conflict, and an Arabization of the Church was intentionally prevented. The Russian Church had until recently a very small local community and thus the conflict of Arabization was avoided. In the analysis and understanding of the first two contextual spheres it is important to explore the relationship of the Church with the governing authorities. The assets of the Greek Orthodox Patriarchate and the Russians were accumulated mainly during the Ottoman period, but managed under many regimes: Ottoman, British Mandate, Jordanian and Israeli. In the middle of the 19th century for example large purchases were done around Jerusalem by the secretary of the Greek Orthodox Patriarchate, Nikophorus Petasis and by the Russians. According to James Finn the British consul in Jerusalem, the principal motivation for Nikophorus’ actions was the strengthening of Russia’s holdings. Finn believed that he acted as an agent for Russia. In an important document from 1850, he claimed that the purchases were part of a plan to create a ring of Russian and Greek Orthodox properties around Jerusalem that followed the same line as Roman General Titus’ army’s encampment when it laid siege to Jerusalem in 70 A.D. This claim may not necessarily be true. By the end of Ottoman rule in Palestine, the Greek Orthodox Church had bought and owned 631 properties in all. An important factor, which allowed it to accumulate properties with relative ease, was its close relationship with the Ottoman Empire and the Russian government. Two major sources of income for the Greek Orthodox Patriarchate of Jerusalem until the First World War were: the income from properties in Bessarabia and Wallachia, and the contributions of Russian pilgrims who visited the monasteries of the Patriarchate at the holy places. With these incomes the Patriarchate and its monks were able to purchase large quantities of land. After the Crimean War (1853-6), the Russians embarked on purchasing land through the agency of the Russian Ecclesiastical Mission in Palestine and the Russian Orthodox Palestine Society with funding from both the Imperial Government and private sources. For example, Russian financing was used for the construction of churches, monasteries, as well as for the construction of secular institutions. The Russians bought and owned according to our study at least 60 properties in Palestine. From the point of view of location preferences of the Greek Patriarchate, they initially purchased assets with religious or historical importance – those connected with the origins of Christianity – and others in close proximity to them, mainly in and around the towns Jerusalem, Bethlehem, Jaffa, Nazareth, and around the Sea of Galilee. The spatial distribution of the Russian church properties exposed its objective of putting down Russian roots in Palestine within the framework of its rivalry with other Great European Powers for influence in Ottoman controlled Palestine. Like other Christian groups, it purchased properties in areas of archaeological and historical significance: the monastery at Gethsemane and the Monastery of the Ascension on the Mount of Olives in Jerusalem, the Alexander Nayevsky Church in the Old City of Jerusalem, [Fig. 5: Russian Alexander Nayevsky Church in Old Jerusalem (Kark, 2005)] the chapel on the Jordan River, and the monastery in Tiberias. Within the framework of encouraging Russian pilgrimage to the Holy Land, hospices were constructed in Jerusalem, Hebron, Haifa, Nazareth, Jaffa, Jericho, and Ramleh. On the eve of the First World War, the Russian Church reached the height of its activities. In its possession were also properties in villages near Jerusalem and villages in northern Palestine, as well as on Mount Carmel. Following the Bolshevik revolution of 1917, the Communist regime arose with its anti-religious character. The financial and political support of religious institutions was halted as well as the Russian pilgrimages to Palestine. In addition, the new Russian government discontinued Russian support for schools and programs that benefited the Orthodox Christian population of Palestine. Only monasteries and churches remained active since they were supported by the incomes from properties that were leased to the British Mandate government. There are similarities and differences in spatial distribution and extent of the settlements in which properties of the Russian Church and the Greek Orthodox were located in 1914 and 1921. Figure 7: Spatial distribution of properties owned by the Greek Orthodox Patriarchate in 1921 and properties owned by the Russian Church in 1914. In both cases, most of the properties were found in the Jerusalem area and the Galilee but also in Lydda, Ramleh, and Jaffa. However, there are numerous rural settlements in the Jerusalem area, the Galilee, Samaria, the Judaean foothills, and the coastal plain where there were properties belonging to the Greek Orthodox Patriarchate and none belonging to the Russian Orthodox Church. In fact, only in the region of the Hebron Mountains were there Russian properties but no Greek Orthodox properties. We do not possess exact figures for the size of areas in the possession of the Russian Church, but they may be estimated to be in the hundreds of dunams, far from the tens of thousands of dunams of the Greek Orthodox Patriarchate. However, a number of the Russian owned properties are of substantial economic value such as the Russian Compound located in the downtown of Jerusalem today and the Russian Church at Abu Kabir in Jaffa. At the height of its activities, the Russian Orthodox Palestine Society operated 111 schools in Syria and 20 in Palestine in an attempt to compete and win the hearts and souls of the Arab Orthodox believers. In addition, two teachers’ seminars were established in Beit Jala and Nazareth. According to a Russian estimate dating from 1907, the value of only a part of these properties came to two million rubbles (Ј206,000). Conflict in the Galilee arose during the period when Russia attempted to attract the Greek Orthodox believers and in parallel have them rise up against the Patriarchate. This created conflict and motivated the Patriarchate to provide its followers with religious and educational services (83 schools), in all probability to prevent their leaving the Greek Orthodox Church for the Russian Orthodox Church or for other churches such as the Greek Catholic Church. The relatively limited area and spatial distribution of Russian properties in comparison with that of the Greek Orthodox Church, and the fact that it did not become and economic or political power in Palestine, demands an explanation since both were active and acquired most of their properties during the same period. Furthermore, the financing for the purchases by the Russian Church came from one of the most important world powers during that period. Part of the explanation is that the Russian Church did not have the longstanding historical presence, the privileged legal and political status that the Greek Orthodox Patriarchate had in the Ottoman Empire and in the Holy Land. The Russian Church entered into a struggle and competition with the Western Powers in the Ottoman Empire without any holdings in the Holy Land, and particularly no possessions that bore an income like those of the Greek Orthodox Patriarchate at the holy sites. The implication of this was that all the Russian purchases of properties that were intended to be used to provide services to the Orthodox pilgrims and clergy required Russian financing. Indirectly, it also financed most of the purchases made by the Greek Orthodox Patriarchate. Like other foreigners in the Holy Land, the Russians ability to purchase real estate was limited until the end of the 1860s by the Ottoman Land Laws. Unlike the Greek Orthodox Patriarchate, the Russian Church did not belong to the millet system and it did not have any rights to the properties of the Orthodox community. In addition, its relations with the Ottoman regime were often tense and not as strong as were those of the Patriarchate, even though the Russian Church was recognized during the second half of the nineteenth century. All these limited the Russian Church’s capacity to purchase or receive properties in contrast to the Patriarchate. Christian Churches that operated in Palestine in the nineteenth and twentieth centuries played an important role in the sphere of capital investment in real estate and development. Among them, the Greek Orthodox Church and its Jerusalem Patriarchate took the lead. The Patriarchate took advantage of windows of opportunity that allowed it to considerably expand its stock of property and initiate wide-ranging entrepreneurial activities. This conclusion is strengthened through the comparison with the real estate activities of the Russian Church, which had as much financial power and the aspiration to strengthen its presence in the Holy Land, but lacked the appropriate circumstances and legal status, hence limiting its ability to purchase real estate. With the outbreak of the Bolshevik Revolution in 1917, the Russian government support for the flow of Russian pilgrims to the Holy Land ceased and the Patriarchate was cut off from its properties in Bessarabia and Wallachia. This resulted in a severe financial crisis. The expansion of the Patriarchate’s and the Russian’s stock of land came to a standstill in 1917. The uniqueness of these ‘relic’ properties of the Greek Orthodox Patriarchate and the Russian Church in Israel/Palestine, beyond their spatial and economic influences over time, is their political and economic value in the present. The economic value of many of the properties is estimated today in the tens of millions of dollars, particularly those in urban centres such as Jaffa, Nazareth, and Jerusalem. These properties attract the interest and involvement of Governments (Israel, Jordan, Greece and Russia, as well as the Palestinian Authority) and private entrepreneurs. The economic and political significance of these properties enabled the Patriarchate and its monks to achieve major political and financial gains. This is to be dealt in a separate paper.